This little building was returned to community use 20 years ago when the Parish Council agreed to lease the shop and upstairs flat to the three churches in Datchet (Anglican, Baptist and Catholic), to run as an Ecumenical Parish Centre. This was a very appropriate new use because its origins were as an almshouse or poorhouse in the time of Henry VIII and Elizabeth I, although no part of the building is as old as that. By 1822 it had become a shop belonging to the Ecclesiastical Parish, and passed as such to the Civic Parish Council when it was established in December 1894. The shop front and windows date from 1890 or possibly earlier. The plaque on the front wall, the first in the Parish Council’s series of commemorative plaques, records that the building’s restoration was completed in the centenary year of the Parish Council’s foundation, in 1995. 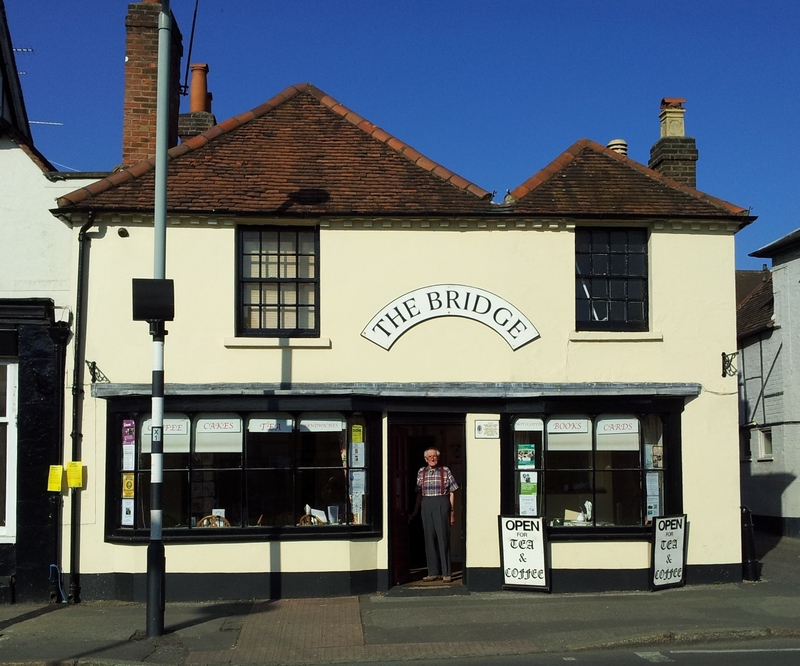 Since then, ‘The Bridge’ has become a cornerstone of Datchet’s community life, significantly placed at the heart of the village. This extract from a 1548 survey of the Manor of Datchet records that the Churchwardens of Datchet Parish Church paid 12d rent per year for a house called Matthews. The Latin document was written a year after the death of King Henry VIII. It was called an almshouse but was not a properly established one endowed by a named individual, just a cottage used to house destitute people by the parish church authorities, which has responsibility for the parish’d poor from Tudor times. One of the tenements of the almshouses is to be forthwith repaired for William Warner and his family who are in no condition to pay rent, being reduced to poverty by sickness. Such necessary repairs in and about the almshouses are to be done before Michaelmas Day yearly, the delaying of such to the winter quarter being an interruption to the poor there and being less effectual doing repairs so late. The Trustees and their builders viewed the almshouses. Finding the walls and foundations in a ruinous condition, they are of the opinion that the taking down of part of the almshouses will be less chargeable to the Trust than repairing. And as the farmers present made a voluntary offer that their carts and horses shall carry all the brick that shall be wanting for the building, agreed that the most ruinous and decayed part of the houses be rebuilt and that so much of the old materials as will serve again be used with the new work. In 1762 two other rooms were rebuilt, which may have been the last rebuilding before recent times. A much bigger poorhouse or workhouse was built at the end of our Holmlea Road in 1793. This old village almshouse was at first leased out as a dwelling and then by 1830 as a shop. 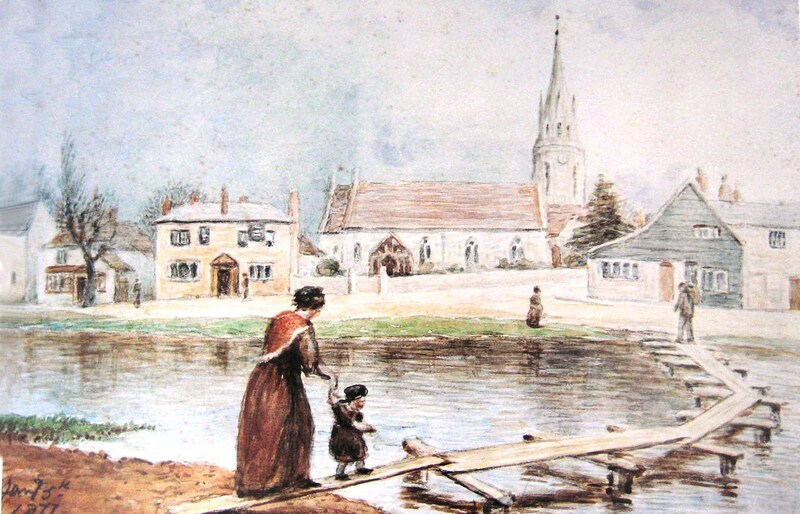 The rent from the shop contributed to the Church Parish poor rate, and then from 1895 when the Civic Parish Council was established, this rent went towards the general local rates. Edward Pond, a grocer, ran the first shop in this building and lived here with his wife and family of eight children from the 1830s to the 1870s. 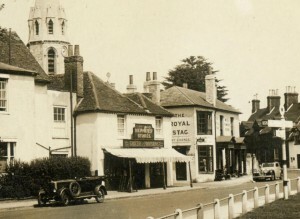 In 1894 secular Parish Councils were first established in rural areas, and in the spring of 1895 the new Datchet Parish Council considered the properties and responsibilities it had inherited from the Ecclesiastical (Church) Parish. The new Councillors recorded that Mr Wilkinson’s shop, known as the ‘Almshouse Trust’, was a parish property and should be transferred to their ownership under the new Local Government Act. They discovered that there was no trust deed or endowment, but that it belonged by custom to the Churchwardens and Overseers of the Poor. The origin of the property mattered because it affected the use to which the rent was applied. If it belonged to the poor, the money should go to them, rather than to the general parish rate, which would reduce the amounts richer ratepayers had to pay. In the end, the subject was quietly abandoned as no documentation could be found anywhere. The absence of any deed or proof of ownership has caused problems since, although the legal position is now clear as far as the Charity Commission is concerned. 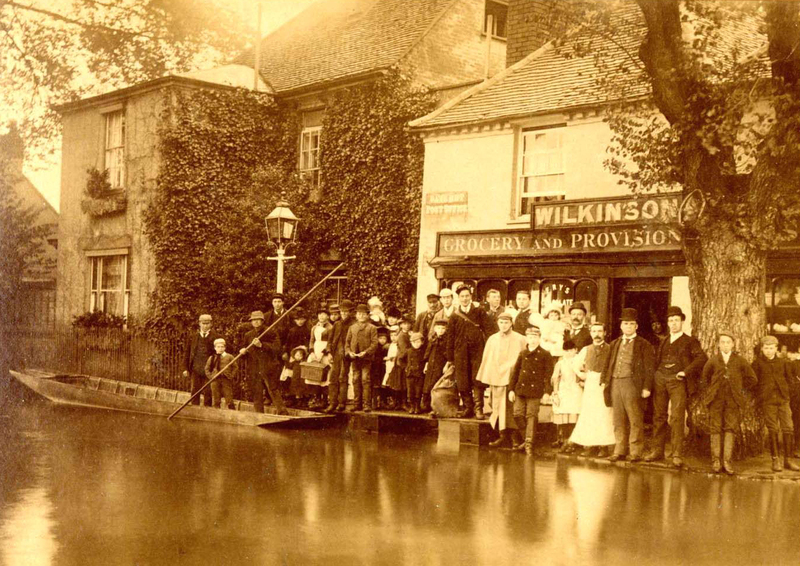 George Wilkinson, grocer, was the next shopkeeper and also the village postmaster. He and his wife lived here with their five children. 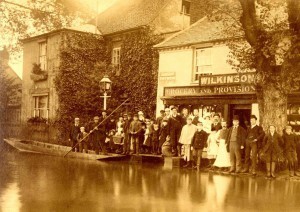 This photo was taken during one of the great floods in 1891 or 1894; Mr Wilkinson is the small man wearing a long white apron in front of the shop door, and Mr Penn the postman can be seen further left holding his sack of post. 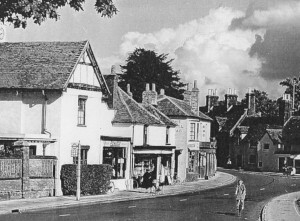 The photo also shows that the present shop windows had been built by then and so must date from about 1890. This early kitchen range has survived in the back room of the Bridge where the Help Point meets. It is a small example of its type and is very difficult to date, but ranges became available from about 1840 and were still in use well into the 20th century. They were the forerunners of modern Agas and Rangemasters. It is in good condition and bears the model name Melrose but apparently no maker’s name. 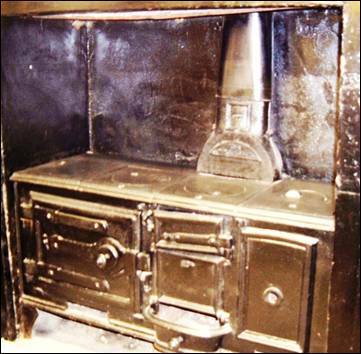 It has a firebox in the centre, an oven on the right and a water boiler to the left with hobs on top. It may date from the time of the Pond family but more likely the later decades of the Wilkinsons. 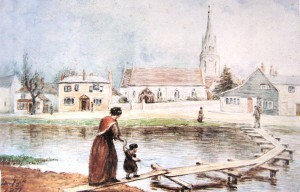 Following George Wilkinson, the Parish Council’s shop was rented by Albert Hepher. 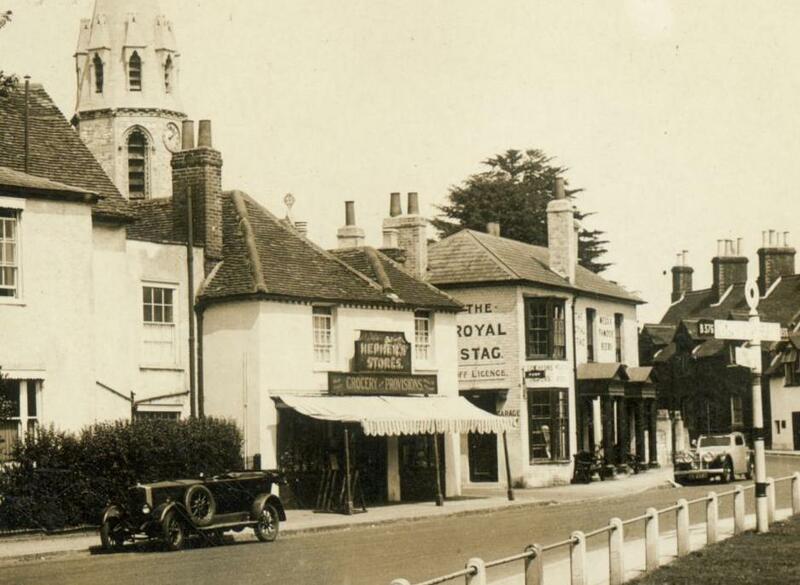 This photo is undated but the cars suggest it was taken in the early 1930s. 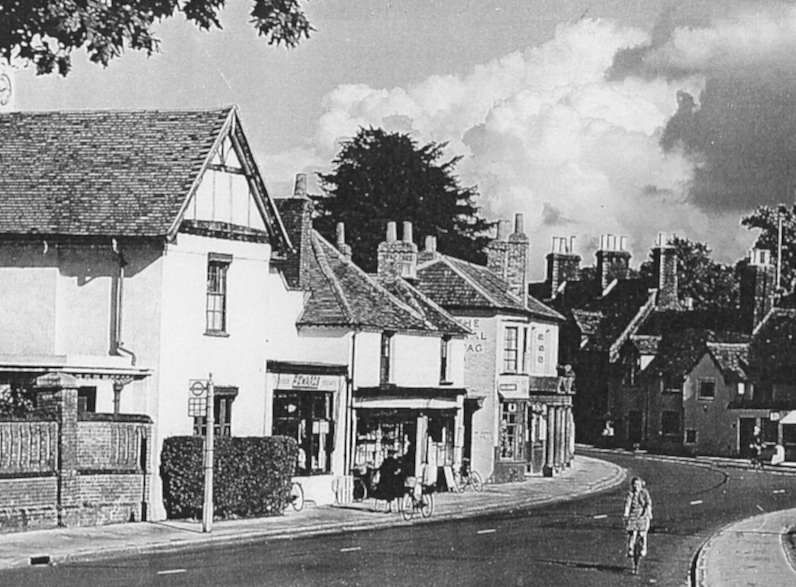 By 1935 another shop had been built next to the Parish Council’s shop and Albert Hepher’s Grocery Stores moved there. 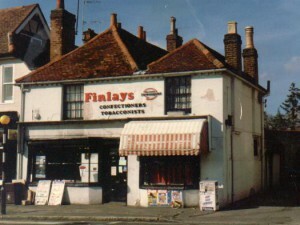 The original shop then became a newsagents’, at first run by Arthur Pickett. 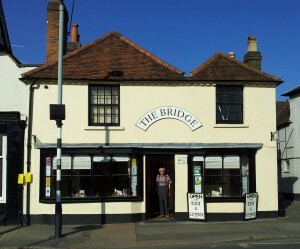 From the late 1940s Frank Howat ran the newsagents shop (in The Bridge) and the grocer’s shop next door became Edwards. In 1993 Datchet Parish Council began a complete renovation of the building which was then leased to the three village churches (St Mary’s, St Augustine’s and the Baptist Church), as an ecumenical drop-in centre and coffee shop. So this little building which housed the poor 450 years ago was restored to the heart of Datchet’s modern community.